The school has a very active involvement in Gaelic games with teams in football, hurling and camogie. Boys and girls from 3rd class upwards are welcome, regardless of whether the child is a member of a GAA club or not. Please note, all children must have a gum shield to play. The under 11 matches take place before Christmas and the under 10 and senior matches take place after Christmas. 2018 marks the return to the Cumann na mBunscol hurling league for Scoil an Linbh Iosa. 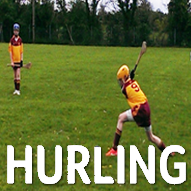 The boys began showing an interest in hurling early in the year and training commenced in February, although hindered a little by the snow it did not slow down the boys preparation and training for this hurling league. The boy’s first match was a home match against a very talented Kill team. It was a great sight to see our school field such a strong team and to eventually win out the game. Fionán Manders made some fantastic scores and showed great stamina and strength at centre forward. Conor Sullivan, at centre back proved he was a force to be reckoned with as he carried the ball from defence on many occasions and made some great scores to ensure the lads had a comfortable lead. The number of parents who came to watch was much appreciated and all commented on how proud they were to see their lads play such a skilful game of hurling in Caragh GFC. The second game was against a very strong Straffan side who were eventual winners of the overall league. We were evenly matched for much of the game but Straffan proved to have luck on their side on the day and Prosperous missed out on some scoring chances. The team were missing their full back Jude Harman on the day and he was a great loss to the team. Oisín Bagnall showed great skill and athleticism in goals. Fergal Mc Kennedy proved to be a rock in defence and made many great clearances. The boy’s third match was against Cappagh, which was played at home. Prosperous were plagued by injuries, missing from action on the day was speedy corner forward Kevin Ward, skilful centre forward Fionán Manders and talented goalie Oisín Bagnall. The lads knew they would have a tough battle ahead of them. The lads dug deep and the scoreline reflected very little between the teams. Donnacha Fitzpatrick shone on the day at half back and led the attack from the defence. Conor Sullivan showed great leadership and secured many vital scores for the team. John R Walsh showed strength, composure and skill and was vital to his team on the day. The score line was neck and neck all the way through but when the final whistle blew there was just one point between the two teams and Cappagh were the victors. Cappagh went on to win their semi final and play Straffan in the final. Straffan were the outright winners of the competition. To mark the end of the hurling season we took the lads for a much deserved ice cream even though they were reluctant to miss out on class time! 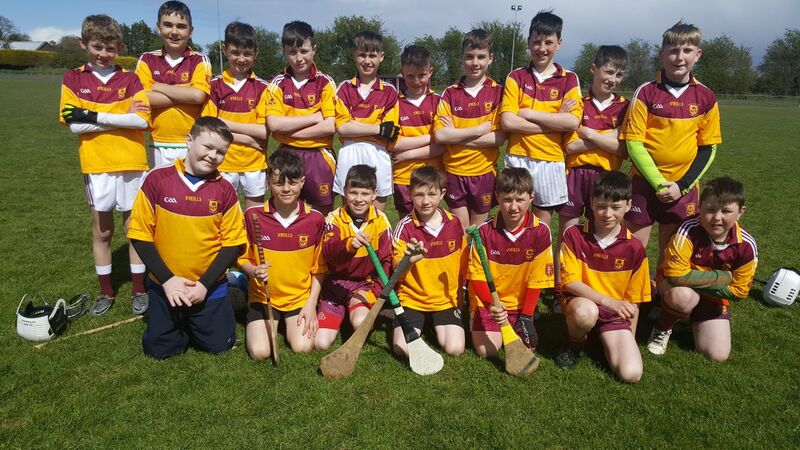 I would like to thank all the parents for their support of their children in relation to hurling this year and I would like to thank Éire Óg Corra Choill for the equipment and encouragement which we received. I would like think that these boys are the makings of fine young hurlers and would like to see them take the skills they have learned and progress with their club teams. It was a pleasure and a privilege to work with the lads this year. They have a great sense of sportsmanship and it was lovely at the end of each training session the lads would always come up and say thank you and ask if we needed any help.